This month's website of the month goes to Easy Bin Rubbish Removal . Easy Bin Rubbish Removal offer rubbish removal services throughout Hampshire and the London area. From mattresses to patio, Easy Bin Rubbish Removal will take it away for you. 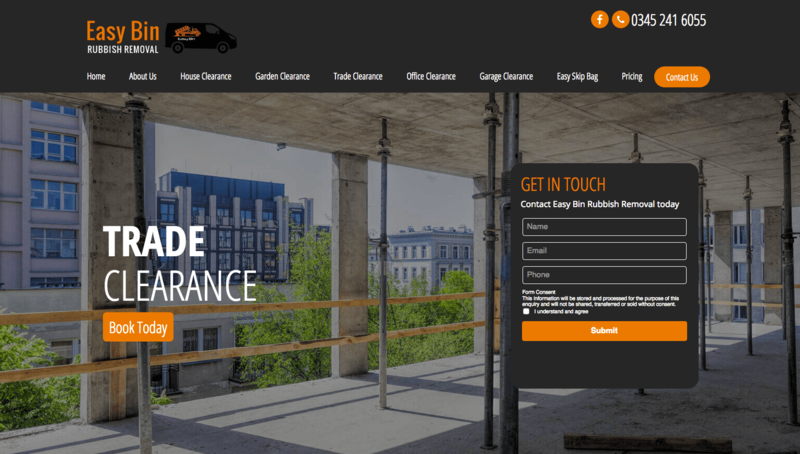 The website features a black and orange design, matching the company logo, company vans and brand standards. The website features scrolling images at the top of the homepage, parallax images throughout the site, hover effects on some of the images and SSL security. Easy Bin Rubbish Removal have a mixture of photos and icons. Their photos consist of their branded vans and work they've done, whilst the icons represent services provided by Easy Bin Rubbish Removal.